Cooking a whole chicken in a roasting bag seals in the flavour and saves on washing up. Preheat the oven to 200°C, gas mark 6. Rub the chicken all over with the cut side of a garlic clove. Crush the rest of the garlic and mash with the butter, thyme and freshly ground black pepper. Use your fingers to spread the butter all over the top of the bird. Place 2 of the lemon quarters in the cavity. Place the chicken in a medium-sized roasting bag and loosely seal. Make 4-5 small slits in the top of the bag. Place the bag in a small roasting tin and cook, according to pack instructions, for about 1 hour 40 minutes or until the meat is thoroughly cooked and the juices run clear. Check by piercing the thigh with the tip of a sharp knife directly through the bag. Remove the chicken from the bag - taking care to keep the juices in the bag - and allow to stand while you prepare the gravy. Snip a corner off the bag and pour the juices into a small pan. Stir in the redcurrant jelly. Mix the cornflour to a smooth paste with a little cold water, then gradually add to the gravy. Slowly bring to the boil, stirring all the time. Add the Worcestershire sauce, season and simmer for 2-3 minutes until thickened and reduced slightly. 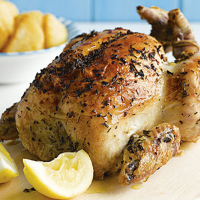 Carve the chicken and serve with the gravy, Waitrose Roast Potatoes, runner beans and Chantenay carrots, garnished with the remaining lemon quarters. You can use roasting bags for cooking other joints, too. Piercing the bag, as in the cooking instructions above, will ensure that the meat still browns.